If justice is what love looks like in public, as Dr. Cornel West says, then teaching is what love looks like in practice. Teaching children well is proof of the love that we have for children, for society and for the future of the world. Expertise, maturity and ethics may be the branches, but the root of even these disciplines is a deep and abiding love for the profession itself. “That will be 1.65 sir,” the bus driver said to me at 5:50 a.m. nearly 12 years ago. As I walked to my usual spot at the back of the bus, I slung the box of papers I carried with me from the night before. I would ride this bus into downtown Baltimore and then catch another one into the outer reaches of the city. “Hi, Mr. Parker!” students and teachers would yell as I scurried into class to begin the day of teaching. I would repeat this process each day until I got a car—nearly three months into my first year of teaching. My early mornings and late nights were filled with planning and all the time in between was jammed with earnest attempts to put the two together to form cohesive instruction. It was in this process that I learned the true hours of operation for a teacher – from the moment you wake up, to the moment you go to sleep. Even in all of the educational leadership roles since then, my commitment to a process of improvement that has been the strongest lever of support in my career. “You have to fall in love with the process of becoming great,” NBA Star Blake Griffin once said. He was right. “Well, you are here almost every day, you dress up like you’re going to church, and you help us when we have problems,” the young man said. 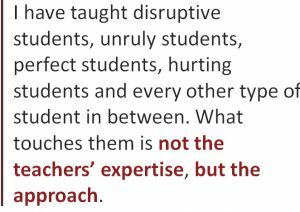 I have taught disruptive students, unruly students, perfect students, hurting students and every other type of student in between. What touches them is not the teachers’ expertise, but the approach. Treat them. Talk to them. Listen. The love and empathy in your heart for who they are is the sanctifying quality of transformative instruction. My heart breaks every time I have to break up a fight or see a student in distress. I feel such loss whenever a student reveals that they cannot read or write well, despite being in school for over 10 years. These heart-breaking moments keep me connected to the fight for improving the outcomes of children – both educationally and socially. Activist and author Bryan Stevenson says that ‘we must become proximate to pain to build the capacity to help the least of these among us.’ It is our close connection to the ways the profession can hurt us, squeeze us and push us to the limit that can ultimately fuel our drive to making education work for all children. 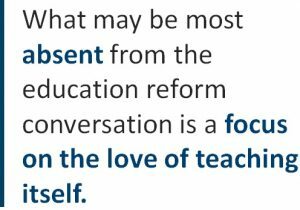 What may be most absent from the education reform conversation is a focus on the love of teaching itself. Not a love of the public schools versus charter schools. Not a love of one political perspective over another. Not a love of one solution at the expense of another. I’m talking about a fundamental love of teaching itself. If we all embrace and appreciate the hour-by-hour, year-by-year sacrifice educators make to ensure that children from every zip code, ethnicity, perspective and orientation get a quality education, maybe we can fall in love with the promise of teaching all over again. What will save teaching is teaching.